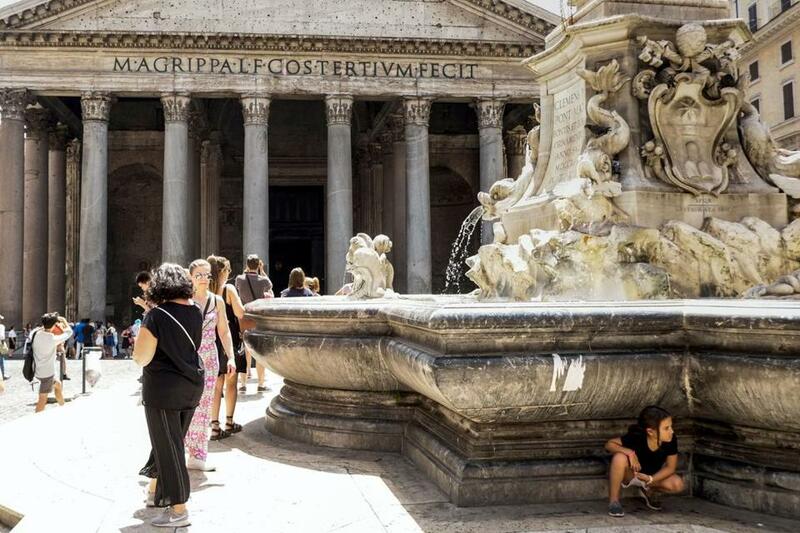 A girl sought shade near a fountain in the Piazza della Rotonda in Rome as temperatures reached more than 104 degrees. BELGRADE — A relentless heat wave that gripped parts of Europe last week and sent temperatures soaring to record highs showed no signs of abating Saturday. The severe heat in Serbia, Romania, Croatia, and parts of Spain, France, and Italy has caused at least two deaths, fueled dozens of wildfires, damaged crops, and strained water and power supplies. Authorities issued health warnings for the weekend. In some areas, officials restricted traffic and banned outdoor work during the hottest part of the day. Spain’s national weather service on Saturday issued an emergency health warning in 31 of the country’s 50 provinces as forecasters predicted temperatures of up to 111 degrees. In contrast, countries of western and northern Europe are experiencing colder and wetter weather. Although southern Europe is used to scorching summers, meteorologists said heat waves of this intensity are rare. Officials have not said whether the heat wave in southern Europe reflects global warming. The White House formally notified the United Nations on Friday that it intends to abandon the Paris agreement on climate change but remains open to “reengaging” on the accord. The United States will participate in UN climate negotiations later this year despite its planned withdrawal, according to the administration’s statement of intent. The letter has no legal weight and does not set in motion the United States’ departure from the pact of nearly 200 nations to curb planet-warming greenhouse gas emissions. Rather, it is a political document that affirms President Trump’s declaration in June that the Paris agreement is a bad deal for the United States. In Romania, police banned heavy traffic on major roads in daylight hours during the weekend because of the heat, while trains slowed down. A train service in southern Serbia also was delayed earlier this week after tracks buckled in the heat. Romania reported two heat-related deaths — a 45-year-old man collapsed and died Friday while working in a field in the northeast, while a 60-year-old man died of a heart attack in the street in an eastern port Thursday. The Belgrade public health institute issued instructions for coping with the heat, telling people to keep wet towels on windows if there is no air conditioning, and avoid physical strain and alcohol. Thousands of residents sought refuge at the city’s recreation area, swimming in the local lake and the Danube or the Sava rivers. Some of those who ventured to the city center dipped their feet or wet their hair in the fountains. The high temperatures came as a shock to Australian Mira Balic, who was visiting Serbia at a time when it’s winter in the Southern Hemisphere. Belgrade was among the hottest cities in Europe on Saturday and hotter than Egypt’s capital, Cairo — which is normally far hotter than central Europe. Animal protection groups urged citizens to place plastic bowls with water outside their buildings and in parks for Belgrade’s many stray dogs. The state railway company in Hungary said it would distribute water at busy terminals. At the Budapest Zoo, Beliy and Seriy, a pair of 2-year-old polar bear cubs, were given huge chunks of ice and freezing-cold watermelons to help them withstand the weather conditions. Some 15 wildfires had been reported in Albania, and dozens of others throughout the region. Hot and dry weather scorched crops amid fears of water shortages in Italy and Serbia as authorities appealed for care in consumption. In the Alpine nation of Slovenia, authorities reported earlier this week the first-ever ‘‘tropical night’’ at 4,900 feet in the mountains, meaning temperatures were higher than 68 during the night. In Croatia, health authorities reported a surge in emergency calls over the past week. They appealed to the thousands of tourists vacationing along the country’s Adriatic coast to be careful on the beaches and while traveling. Greece is going through its second major heat wave of the year. Temperatures were forecast to reach 108 degrees in parts of mainland Greece over the weekend.